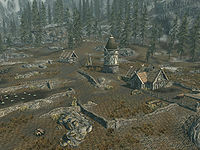 Pelagia Farm is a large sprawling farm south of Whiterun owned by Severio Pelagia. 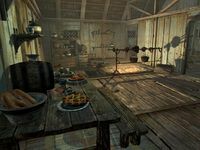 It is a small single story building that is maintained by Nimriel and Gloth, who live at the farm, while Severio lives in his house in Whiterun. When approaching Pelagia Farm for the first time, the player will come across Aela the Huntress, Farkas and Ria battling a giant. The group of Companions will always win the fight. Speak with the leader of the Companions: Prove you are worthy to join the Companions. There are at least three fields of vegetables with either stone walls or fences segregating them. During the day Severio Pelagia is in the fields with his workers, he will gladly buy any cabbages or potatoes you hold. There is a grain mill to the east of the house and several other outbuildings and storage sheds around the property. To the west of the house is a pen for a cow and a few paces in front of the entrance are a couple of chickens' nests. Upon entering there is a long wooden table and bench on your left against the west wall, with an apple pie, a few carrots, three boiled creme treats, a green apple, a bowl containing several loaves of bread, and an eidar cheese wedge on the table, with a chair at either end and a wall shelf above holding crockery. On your right as you enter, against the east wall are a stack of food barrels and sacks next to a bookcase holding fourteen common books, a copy of Songs of Skyrim: Revised and a bowl containing a cabbage. Next to this is a doorway to a bedroom. In the northwest corner of the room is a cupboard holding a cabbage, a goat cheese wedge and a leather strip, among piles of crockery. There is a chair next to the cupboard with a bottle of ale and a couple of plates on the floor and two more wall shelves above holding clutter. There is a second doorway on the east wall with a large fire pit between the two of them with a cooking spit hanging over it. The first bedroom contains a single bed against the north wall and a dresser beside it with a bottle of alto wine, a set of clothes, a gourd in a bowl and a copy of Rising Threat, Vol. IV on top. There is a chair in the southeastern corner. The second bedroom contains a single bed against the south wall, with an end table beside it, holding a bottle of ale, a silver ingot and copies of Yngol and the Sea-Ghosts and The Book of Daedra. There is also a narrow table against the north wall with a bottle of ale, a salmon steak on a plate, two common books and a draught of health on top, a pair of iron boots underneath and a chair in front of it. Though you can find and activate a grain mill here, it will only lead to an animation, with no actual function in the game even with Hearthfire installed. Esta página foi modificada pela última vez à(s) 20h18min de 4 de outubro de 2015.